Today marks the 74th anniversary of the famous letter that physicist Leo Szilard wrote to President Franklin Roosevelt. In the letter Szilard alerted the president to the startling recent discovery of nuclear fission and more ominously, warned him that Germany had likely started working on the implications of this discovery for waging war. When FDR saw the letter, he famously called his aide "Pa" Watson and handed the letter to him saying, "Pa, this requires action". Thus began the momentous road leading down to the Manhattan Project. But Szilard had seen this road six years before, at a traffic light in London when, stepping off the curb he saw the essence of energy from the atom before anyone else. The above account may sound strange and raise eyebrows since I seem to have omitted the name of the one famous person who is most associated with the FDR letter - Albert Einstein. But the point that I want to make is that a story about the letter focusing exclusively on Szilard will still be more accurate than a story focusing exclusively on Einstein. Both accounts would be inaccurate, but in Isaac Asimov's words the second would be "wronger", and yet it's the one that has stuck in the minds of most people. Leo Szilard remains one of the most brilliant, wide-ranging and underappreciated scientists in history. Bill Lanouette has performed an invaluable social service in writing a brilliant and definitive biography of the man which is a must read. In case of the so-called "Szilard-Einstein letter", Szilard's role cannot be overemphasized. First of all, he was the one who, based on his unique traffic light insight six years back, instantly grasped the terrifying implications of nuclear fission for war. This was based not just on his scientific insight but on his incredible political insight, a trait that had constantly marked him apart from his fellow scientists. More than almost any of them Szilard saw political events before they overtook the world, and this time was no different. But Szilard was not just a man of thought, he was also one of determined and preemptive action. He immediately recruited the efforts of his fellow Hungarian scientists Eugene Wigner and Edward Teller in communicating the importance of the momentous discovery to the highest powers. At first Szilard's overriding concern was regarding the existence of uranium ore in the Belgian Congo which Germany could hoard. He wanted to alert the Belgian royal family, and he realized that the one person in his circle who knew them was Einstein. Szilard and Einstein were old friends and colleagues, having filed a patent for a refrigerator during their carefree time in heady Berlin in the 1920s. But Szilard also realized that any action on fission would need government support on a massive scale. And he again realized that nobody else in his circle carried the weight that Einstein did. So he recruited Wigner in driving him to Einstein's summer cottage on Long Island. The first meeting was on July 12: When Szilard told Einstein about the discovery of fission and its implications Einstein was completely surprised, saying "Daran habe ich gar nicht gedacht" ("I had not thought about that"); his surprise indicates Szilard's overarching role in initiating the set of events. Szilard not only approached Einstein but also drafted two letters, one addressed to the Belgian ambassador and another to FDR. The emissary for delivering the second letter was going to be Alexander Sachs, an economist who knew Szilard and who had the ear of the president. On August 2 Szilard again had himself driven by Teller to Einstein's cottage. This time Einstein modified the letter and dictated the revised version in German. Szilard came back to Columbia University where he was then installed and asked a stenographer - who thought she must be dealing with a nutcase - to transcribe it in English. The letter clearly laid out the possibility of atomic bombs based on Enrico Fermi's work and also warned about Germany's access to both brilliant physicists and the uranium ore in the Congo. Szilard had the letters signed by his famous friend and gave both of them to Sachs. The rest is history. But the set of events that transpired make Szilard's absolutely essential role in the "Einstein letter" obvious. In fact it's not too much to say that without Szilard the letter would not have been written. Szilard not only instantly grasped the implications of fission but he alerted Einstein, he explained what the problem was and he drafted the letter. Einstein's main role was in listening, approving and signing. These were all important roles, but surely not as important as Szilard's role in willing the letters into existence in the first place. So let's make no mistake about it every time we talk about the famous letter to FDR. Einstein played an important role in being the messenger, but Szilard was both the medium and the message. Without Szilard there would have been no letter. And without Szilard this chapter from Einstein's life would have been erased. As he did in 1939, it's a pity that even today Szilard remains the genius in the shadows. He deserves to always have his memory kept alive. P.S. The Wikipedia entry on the topic is actually a pretty good and accurate account. And Richard Rhodes' "The Making of the Atomic Bomb" is pretty good too. The book opens with the traffic light episode and the index has twice as many entries for Szilard as it does for Einstein. Indeed! One of the great strengths of Rhodes's book is that it gives due importance to Szilard's role. Not regarding Szilard's acts of conscience. The usually-wordy Rhodes doesn't mention the Franck Report at all, and barely mentions Szilard's petition against the use of the bomb. Interesting. I must go back to it now. Szilard was also the key person who helped Edward Teller's mother and sister in getting permission to leave Hungary for the US to meet Edward Teller. Indeed! Losing Szilard as a friend was another one of Teller's tragedies. It is important to emphasize that the letters were all Szilard’s doing. He just needed a big name in science to put his signature to the letter. 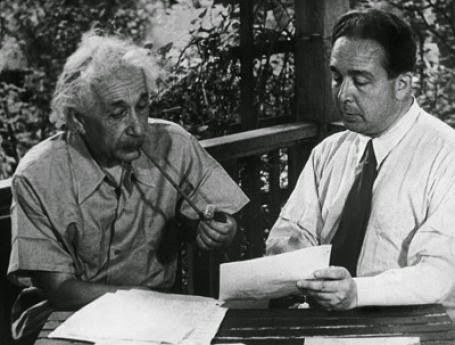 When he first spoke with Einstein about the possibility of a nuclear chain reaction producing and explosive event with uranium Einstein said, “I had not thought of that!” Having Einstein’s signature gave Szilard’s letter the most powerful endorsement possible to get Roosevelt’s attention. The rest of the story of how it took from the fall of 1939 to the beginning of 1942 to actually get started is also important and if it hadn’t been for an Aussie with the British MAUD committee, Mark Oliphant, it might have taken even longer.